Q: How is your window cleaning Norbiton going to restore the transparency of my panes? Interior window treatment – The technicians will wash dirt with ladders and squeegees. Q: Can you rinse my casements during unpleasant weather? A: If you spot rainy clouds on the day of your appointment, don't be upset. The window cleaners in Norbiton can still perform the service provided they're facing a light shower. However, in the event of a cloudburst, we will kindly ask you to put off your appointment to avoid any injuries. A: Yes, you can! The washing team will need a empty parking spot in close proximity to your premises (30 metres or less) and on the same side of your casements. A: It's no problem for the team to polish the exterior surfaces of your glass façade as long as they are free to enter through your front gates. And if smears have landed on your internal surfaces as well, just let us know and we'll perform a free key pick-up and delivery. A: We will immediately inform you about the cause of the specialist's delay and notify you once he parks near your property. A: Yes we're certified to clean any type of casement or window part. What's more, every PVC or UPVC frame or sill will be treated for free! With the proven water-fed rod gear, the professionals can help you outclass your competition at reasonable rates. And you can press down our window cleaning Norbiton rates even further by combining two or more of our cleaning services together! To learn the exact digits behind our price offers, make sure to head over to our handy price table below. Irrespective of where your stains have taken shelter, our capable window cleaning in Norbiton will fight them off with ease. We have covered various washing methods. 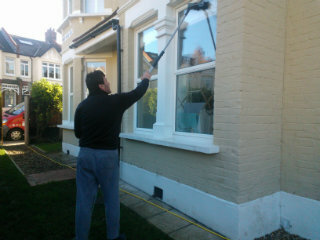 Our external window clean is aimed at properties that do not exceed four floors. To let the daylight back inside, the window cleaners in Norbiton will arrive in a caravan, outfitted with a stretchable water-fed pole. This system is linked to a water tank, filled with filtrated water. After being released as a powerful gush from the pole's brush-head modification, the fluid will erase all blemishes in an attempt to restore its original structure. To access smudgy window corners of high-rise properties, we'll send a seasoned team for rope access window washing. These approved climbers will use well-maintained ropes and harnesses or position ladders and cherry pickers to restore the appeal of your panes. We've got all necessary COSHH documentation in place and follow each and every safety rule and regulation. To make the interior surface of your window façade just as lustrous, the technicians will utilize the usual ladder and sponge washing approach. Over time, we've answered the cleaning calls of customers from many nearby regions. As a direct result, we broadened window cleaning Norbiton's horizon and you can now spot our washing vehicles in the districts below. For those of you who'd rather book window cleaning services Norbiton KT1 online, fill in our get a free instant quote form.